Stephanie Hovancik graduated from Lynbrook HS in 1994 and from St Mary's College, in Moraga, in 1998. Stephanie was a 4-sport athlete during her days as a Lady Vike. As a swimmer, she was MVP her Sophomore and Junior years (she ran XC as a Senior). During Soccer she was a starting varsity member as a Freshman and was MVP her Senior year. As a trackster, she made it to the State Meet in the mile with a 5:07 best. In running XC, only her Senior year, she competed in the State Meet and was MVP that season. She continued her running career at St Mary's College and was Varsity her entire four years there with a 8th place finish in the West Coast Conference Championships her Senior year being her greatest achievement. 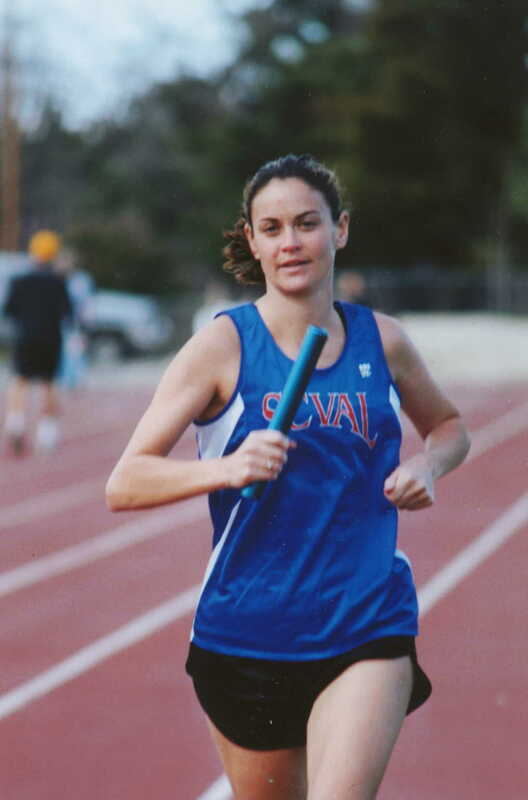 She now teachers First grade at Ponderosa Elementary School, is the Head Girls XC coach at Lynbrook, and competes for Team SCVAL in Corporate Track Meets having run a 2:29 800 at the 2002 Corporate Nationals. Come summer of 2003 she'll be taking on her next endeavor... that of marriage. With a team of Stephanie, Eric and the Vikes - Watch Out!